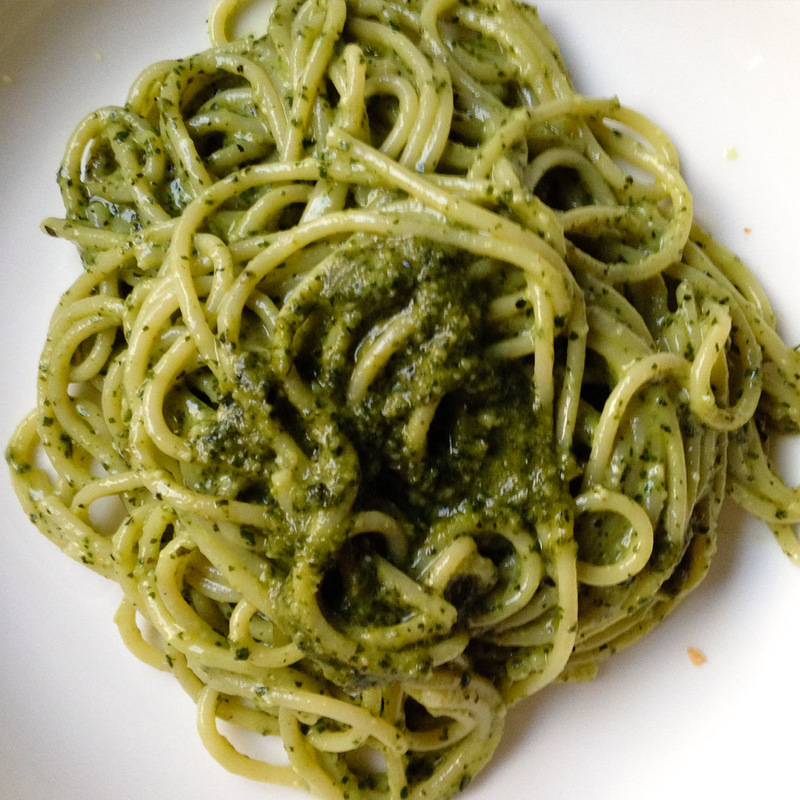 Everybody I know has a favorite pesto sauce recipe – just because if you grow basil you have to have something to do with it when it goes summer haywire and bolts to the sky. And, although I hate giving a name to a traditional dish that I’ve messed around with I don’t quite know what else to call my pesto. I guess I could just call it green pasta sauce. To my version, I add a few mint leaves and a bit of fresh green chile – the former for a bit of freshness and the latter for a bit of the heat that we love. It still tastes like pesto, but with a bit of pizzazz. Try it, you might just like it. Combine the garlic, chile, and pine nuts in the bowl of a food processor fitted with the metal blade and process, using quick on and off turns, until coarsely chopped. Add half of the basil and again using quick on and off turns process to coarsely chop. Add the remaining basil along with the mint and, with the motor running, begin adding the oil, processing until a thick green sauce forms. Add the cheese, season with salt, and give a quick couple of turns to incorporate. If the pesto is too thick for your taste, add more oil. If too thin, add more basil and, perhaps, a bit more cheese. The flavor is yours to decide. If not using immediately, scrape the sauce into a nonreactive container. Smooth the top and cover it with extra virgin olive oil to prevent discoloration. Cover and refrigerate for up to 2 weeks or freeze for up to 3 months. Isn’t it yummy though? On the menu for tonight’s dinner!